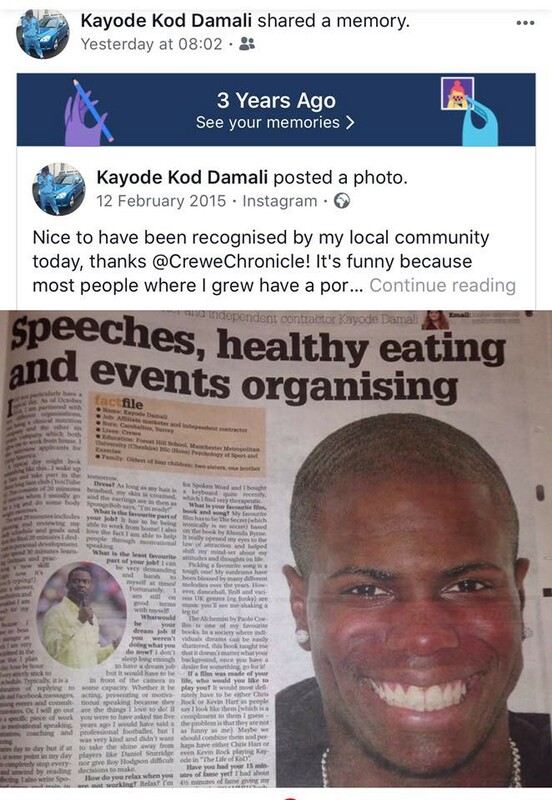 I am writing this blog because three years ago today (13th February 2015 to be precise), I was invited to have an article of myself in the Crewe Chronicle called “A Day in the Life of Kayode” due to my Talks and Speeches, Healthy Eating and my Events. Proud of this achievement, I keep it on my bedroom wall and see it every morning (or occasional afternoon*) when I wake up. 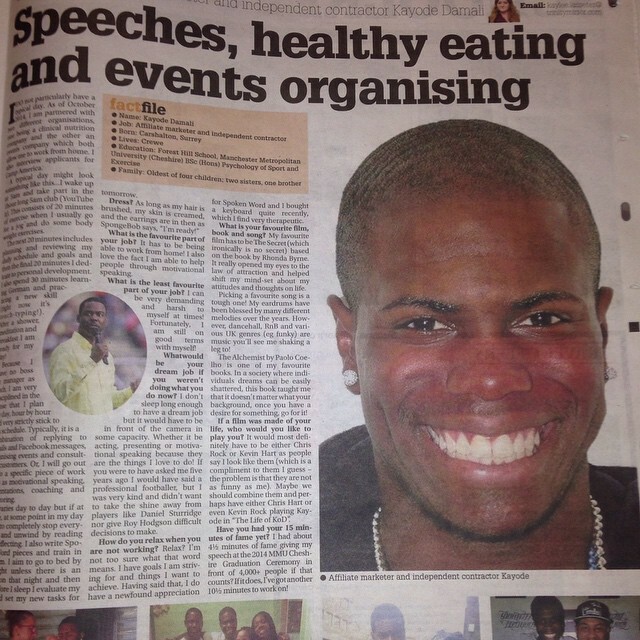 What prompted me to write this blog (other than procrastinating from finishing updating my website amongst others things kmt) is that thanks to the Facebook feature that allows you to share what you posted “On this day” however many years ago, when I re-shared this “On this day” post, a lot of people didn’t know I was in the Crewe Chronicle in the first place. Which is not surprising because I’ve definitely increased my circle of influence within that time (as you should after 3 years). so they wouldn’t have necessarily known I was in it unless I, or someone else, told them. 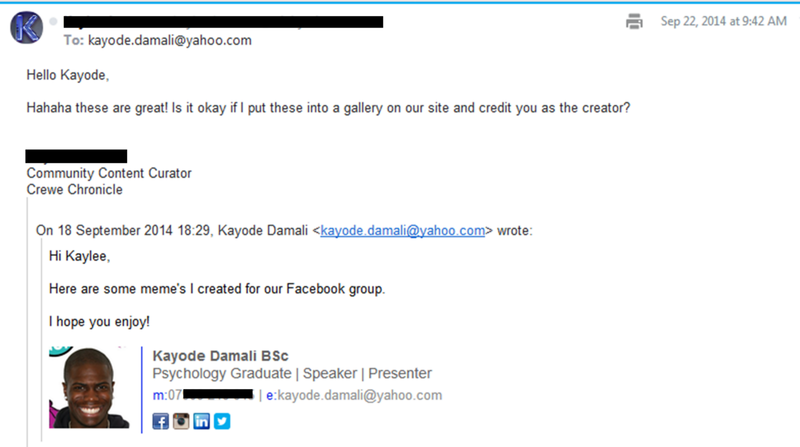 Now the purpose of this blog is not to say “woah look at me” because quite frankly, sometimes I just like to chill and have Kayode time with no attention from anyone. The purpose is blog is to say how I got into the Crewe Chronicle in the first place because people have, not necessarily often, but sometimes asked me how. And to be honest with you, over the years I actually forgot how I did it, up until very recently (earlier this month) when I happened to go back to my email correspondence with the Editor 3.5 years ago and I was like “Oh yeahhhh, that’s how I did it”. And it actually re-inspired to get back some of those habits I unconsciously had back then, so I’m about to share them with you now. Back then in September 2014, I was doing my first Freshers Week independently from the Students’ Union (so the risk was high), I’d just come back from Los Angeles and I was buzzing for this new venture (which almost 4 years later I’m still doing!). 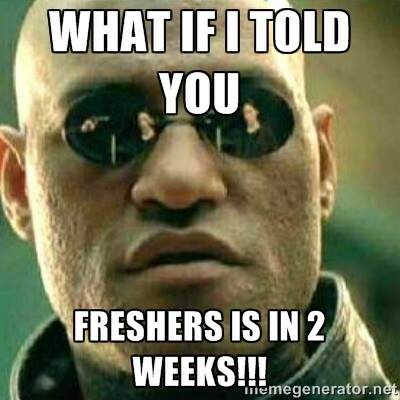 So when it came to my memes, I was more than excited to send them in! 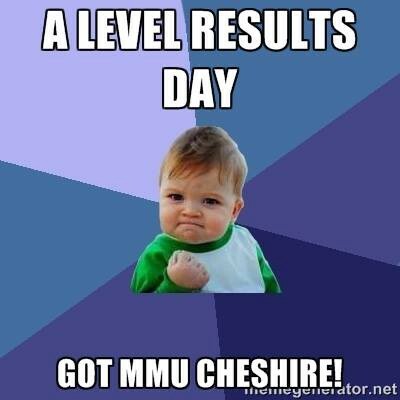 Not even for the Crewe Chronicle to use as promotion for me, but simply because I was bloody well pleased with my memes! The Editor ended up really liking them and I was so gassed that I made even more! After a few back and forths of“Haha’s” and “Lol’s”, the Editor then said to me the Crewe Chronicle is in the process of launching their ‘A Day in the life’ feature in which a local figure responds to a few questions about their average day and most importantly if I would like to take part. Now why do I tell this story? I tell you this story for two reasons: 1) because I believe stories are great metaphors for life lessons and 2) because this story reminded me of the importance of this… to give first / pay it forwards! Why? 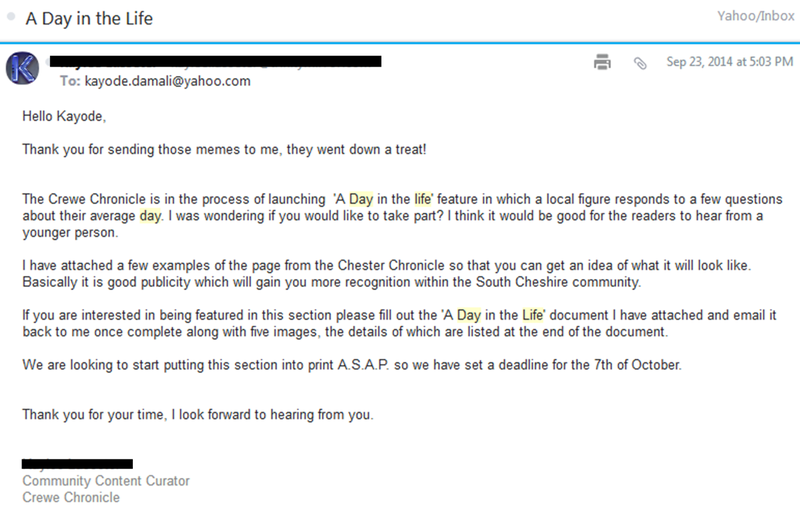 Because had I not offered to send the Crewe Chronicle some memes first for them to publish (expecting nothing back in return other than the satisfaction of them liking my memes), they would not have been curious enough by my email signature to check me out to possibly feature in their new “A Day in the Life of” series. So on a side note, that’s another tip for you. Make yourself a custom email signature! They are free to do (I did and still do mine on wisestamp.com) and they make you look that little more certy (certified) when having email correspondence with someone or an organisation of importance. No excuse not to have one really, it looks so much better than just saying “Kind regards” followed by your name (in plain text…). Now anyway back to it, like I said, the whole reason I was able to feature in the Crewe Chronicle is because I helped them first by sending in memes, which then prompted them to see who I was, which then resulted in them asking me to feature in their new series. Just pay it forwards, go out of your way to help people (expecting NOTHING in return) and quite often “you’ll find this law (of reciprocity) will be on your side” (that is a bar from my Spoken Word piece “The Law of Reciprocity”, go check it out). And just so you know that I practice what I preach, earlier this week on Monday (12th February), I spent 40 minutes on a call mentoring a young entrepreneur on his business ideas. On the Sunday the night before (on the 11th February, so not much notice), I was at the Gym and he Snapchatted me asking if I was free to meet him this week to give him some mentoring. He’d previously asked me months ago saying that he’d like to do it someday. So the first thing I did was pree (check) my schedule on my phone calendar to see where I could fit him in, but my schedule was choc-a-block! It would have been impossible to meet him. So really I should have said no because I was projected to be super busy this week (as I said, I still need to finish my website updates!). But then I thought to myself, “no you know what, I am going to help him” and instead of just saying “no sorry” (which was my initial thought), I offered to mentor him over the phone. Why? Because after all, I don’t care what ANYONE says, NO ONE (unless you’re a mega celebrity, which you are not — no disrespect) is too busy to spare a 5 minute phone call to help someone out. And if you can’t spare that 5 minutes, you obviously don’t care about that person enough, real talk. 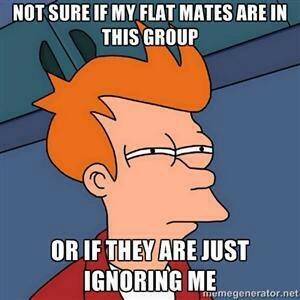 And that goes for girls or guys you like who don’t reply to you back to you too. But anyway, when you want help and guidance and don’t receive it just because the other person can’t be asked, the feeling is horrible and trust me I’ve been there… So to cut a long story medium, we spoke on the phone as mentioned on the Monday morning, I gave him my best tips and advice and you know what, I actually really enjoyed it and wish him the best of luck on his venture. So to wrap this up, I was featured in the Crewe Chronicle, which has done great for me in terms of my PR and generating other opportunities over the years. And the WHOLE reason I got into in the Crewe Chronicle in the first place is because I paid it forward by helping them out first.